What appears to be a meteor trail over eastern Russia is seen in this image released Feb. 15, 2013, by the Russian Emergency Ministry. The meteor fall included a massive blast, according to Russian reports. Hundreds of people are reportedly injured, and hundreds of buildings damaged, after a meteorite streaked across the sky above Russia's Ural Mountains Friday morning (Feb. 15) and exploded in a massive blast. The meteor explosion was centered around the Chelyabinsk region, which is about 930 miles (1,500 kilometers) east of Moscow. Most of the hundreds injured were reportedly hurt by falling glass in the blast, 112 of whom have been hospitalized, due to cuts from the shattered glass resulting from the blast. In addition, an estimated 297 buildings were damaged, including six hospitals and 12 schools, according to translations of updates by the Russian Emergency Ministry. "I would think that this is likely an exploding fireball (or bolide) event caused by the atmospheric impact of a small asteroid," Don Yeomans, head of NASA's Near-Earth Object Program, told SPACE.com. "If the reports of ground damage can be verified, it might suggest an object whose original size was several meters in extent before entering the atmosphere, fragmenting and exploding due to the unequal pressure on the leading side vs. the trailing side." Basically, Yeomans added, the meteor "pancaked and exploded." "This bolide event probably had nothing to do with the upcoming close Earth approach of asteroid 2012 DA14, which is due to pass closely (and safely) past the Earth at 19:24 GMT today," or 2:24 p.m. ET, Yeomans wrote, adding that the Russian bolide trail did not travel south to north as the asteroid will. "And the separation in time between the fireball and 2012 DA14 close approach is significant," Yeomans said. A large chunk of the space rock has reportedly been discovered in a lake in the Chelyabinsk region, CNN reports. A report by the Russian television news agency Russia Today showed video of the meteor, which included what appears to be a fireball streaking across the sky from several vantage points. At times the object is so bright it casts shadows. In 1908, a fireball exploded over the Tunguska River in Siberia, Russia, flattening hundreds of square miles of land during a massive blast. That fireball was created by the explosion of an object about 150 feet (45 meters) across, NASA scientists have said. A similarly sized object, the asteroid 2012 DA14, will fly extremely close to Earth on Friday, but will not hit the planet. The asteroid will approach within 17,200 miles (27,000 kilometers) of the Earth —about 5,000 miles (8,046 km) closer than geosynchronous satellites —during the close shave. Asteroid 2012 DA14 was discovered in February 2012 and is being closely tracked by NASA and astronomers around the world. The asteroid is about half the size of a football field, but will not be visible to the naked eye when it flies by on Friday. A small telescope or binoculars, very dark skies and good timing will be needed to see the fast-moving asteroid. 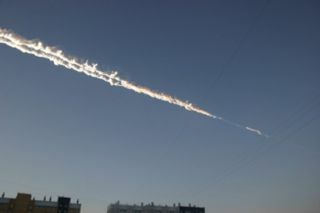 Editor's note: If you snapped a photo or video of the meteor explosion over Russia and you'd like to share it for a possible story or image gallery, please send images and comments to managing editor Tariq Malik at spacephotos@space.com. This story was updated at 7:39 a.m. EST to include the latest injury and damage reports, and comments by NASA scientist Don Yeomans.